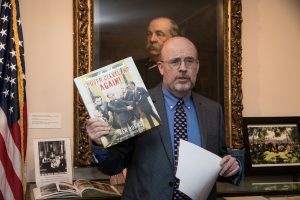 As a second year “Trustee” for the Grover Cleveland Birthplace Memorial Association, I asked our Board Members for anything which was a “first” or “unique” about Grover Cleveland. It is hoped that these “Grover Tidbits” will help one make connections between Grover Cleveland and many other areas of history. He is the only “President” who was a member of the Princeton Board of Trustees. He was the only “President” to invite the Queen of Hawaii to visit the White House. Our birthplace is a frequent stop for people visiting from Hawaii. Cleveland gave a dedication speech at the opening of the Statue of Liberty. During Cleveland’s presidency, the first electric lights were put on a Christmas tree in the White House. During Cleveland’s presidency, he had secret mouth cancer surgery, (held on a friend’s yacht) . He was the only sitting President not endorsed by his party convention (1896). Known as the “Veto King”, Cleveland did not always have an easy relationship with Congress. Cleveland went from Mayor of Buffalo to Governor of New York to President of the United States in Three Years. Cleveland was the first Democrat elected since the Civil War. It’s quite possible that Cleveland was the only one President born in a “Manse”. Cleveland won three by popular votes but elected only twice. The Dawes Commission, known formally as the Commission to the Five Civilized Tribes, was appointed by President Grover Cleveland in 1893 and headed by Henry L. Dawes to negotiate land with the Cherokee, Creek, Choctaw, Chickasaw and Seminole tribes. Tribe members were allotted land in return for abolishing tribal governments and recognizing Federal laws. In order to receive the land, individual tribal members first had to apply and be deemed eligible by the Commission. Grover Cleveland was the only president to officially serve as an executioner (hangman). As the sheriff of Erie County, New York, he performed the role twice and earned the nickname “Buffalo Hangman”. Cleveland was a member of the Democrat political party. He was the only president to be married in the White House. The wedding took place on June 2, 1886. She was 21 years old and became the youngest first lady. Parts of Wedding Cake and its knife still exist and are on display at the “Birthplace”. Cleveland had a substitute during the Civil War but later on he was the Commander in Chief of the New York National Guard then governor and Commander in Chief of the U.S. Military then President. Cleveland was not a fan of “serious” music but he really enjoyed Gilbert and Sullivan operettas attending many performances of their various plays in D.C. theatres. So with the help with the Board, I only scratched the surface about Cleveland’s “uniqueness”. His “tidbits” might be a good way to study Caldwell N.J. History, Hawaiian History, Labor Unions in the United States, Christmas History, Health Status of Presidents, White House History, Native American History, the Civil War, the history of the Draft in the U.S., Immigration issues, and many more areas. More importantly, it’s a way to study the Legislative Branch, Judicial Branch, and especially the Executive Branch. Be sure to stop by to visit our Birthplace. It’s a great way to study American History! This entry was posted in Uncategorized on April 13, 2017 by Janet Markman.